The EOS Rebel T1i is packed with features, both refined and new. In addition to its admirable performance with an all-new 15.1 Megapixel Canon CMOS sensor, DIGIC 4 Image Processor, a 3.0-inch Clear View LCD with anti-reflective and scratch-resistant coating, and compatibility with the EOS System of lenses and Speedlites, the EOS Rebel T1i adds remarkable Full HD video capture at resolutions up to 1920 x 1080. An HDMI port allows for quick connections to high definition TVs and monitors for easy viewing of your stills and video. The entire operation is simple and easy even if you are a beginner. You'll have uncompromised EOS Digital performance with power and flexibility right in the palm of your hand. This camera is a great DSLR to learn advanced photography skills on before spending upwards of $2000 - $7000 for a professional grade DSLR. I also like that when you do decide to upgrade to a professional grade if you go with the Canon EOS series, all the lenses you purchase for the EOS Rebel can be used with all EOS Cameras. I have learned a lot using this camera. The advanced features are easy to learn by internet searches and online tutorials. It is a great camera for a great price. I cannot recommend it highly enough. When I upgrade I will definitely be going with a Canon. My husband and I were on our way to Newberg, Oregon when we saw a sign for the Tualatin River National Wildlife Refuge. We decided to stop by on our way back to Portland and check it out. When we got there it looked like there wasn't much to take photographs of but we decided to start down the trail anyway. As we got about 5 minutes in we saw these strange flying insects and grasshoppers. When one of the flying insects finally landed where we could get a look at it we realized they were flying mantis. As insects tend be skittish when you get to close them I used a telephoto lens to get macro shots of them. There were also hawks and different types of flowers that bloom late in the summer. I would recommend this Wildlife Refuge to anyone who enjoys the outdoors and/or photography. There is many different area's to see and will provide many different views depending on the time of day and year. This brand new58mm Close-Up Set are special manufactured from superior high qualityoptics to deliver premium digital and videophotography. Includes four close-up diopters at +1, +2, +4 and +10magnification, and a durable Filter pouch. These filters simply screwonto the front of any 58mm lens, and will maintain resolution and pictureclarity while magnifying image size. These close-up filters are idealfor photographing small items and focusing in on details of coins, flowers,jewelry and insects, as well as industrial photos of miniaturized components,medical and dental laboratory work and other scientific photography. Special matte aluminum satin finish frame reduces reflections. Black rimmed glass reduces light reflection around the filter edge. I was given a set of 4 Neewer 58mm Macro Filters by my father and they are probably the one item in my camera bag of accessories I use the most. They are simple to use. They require no lens changes. The detail you get with these filters is amazing. 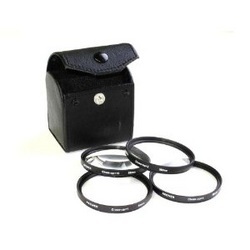 The set that I received was: Neewer 58MM Macro Close-Up Lens Set 4 Filter Kit +1+2+4+10 Magnifications. They come in a nice hard case with dividers for each filter. Using the +1, +2, & +4 can be used without a tri-pod with good results. I would recommend when using the +10 to use a tri-pod for a more stable image. All in all I would definitely recommend this to any person who enjoys photography as a hobby or as a career. Take the box and cut off the top or bottom flaps to leave the wide side is open. Cut a hole in the side of the box so that the box is on it taller side when the hole is facing up. Tape 1 - 2 pieces of tissue paper over the wide open side. Place lamp head in the hole and attach box with electrical tape. Unfold pizza boxes and place food side down with the top against the wall and the bottom on the table top. Place fabric over pizza boxes tucking the top between the wall and pizza boxes. Place item you want to photograph and your light where you would it and your ready to go. Do not leave lamp unattended while on as desk lamps get very hot. Use as low a watt light that will work with your lamp. Do not keep lamp on for prolonged periods. *I am not responsible for the loss or harm of any person, being, place, or object due to use of these instructions. Children Under 18 ask for your parents help before doing this project. Marshall Park has a great little stone bridge crossing the creek. A large wood bridge has a great view of some small waterfalls. There are a ton of plant and tree species. Many different paths wind through out the park some official and some unofficial. A few paths lead to other parks in the area. There is no shortage of beauty for the eyes to behold at Marshall Park. Cannot wait to return in the spring! I just went to see my parents because my dad had my birthday present for me...5 months early. I knew it was for my photography, but didn't expect all that he gave me. My dad is one of my biggest supporters when it comes to photography. He has always encouraged me through out my whole life. So I guess what I am trying to say...Thanks Dad! Gifts included were macro and telephoto accessories, lens hood, book, and cleaning kit. Macleary Park is small section of Forest Park with a beauty all it's own. Balch Creek weaves through Macleary sending an entrancing sound throughout the park. Add on top of that the singing of the birds and you feel as though you are nowhere near a city. The focal point, aside from the gorgeous landscape, is The Stone House. The Stone House is a WPA-era resting station or in today's terms, an outhouse. Looking at it today you would never guess it use to be an outhouse. It looks almost like an old stone house that's with stood the test of time. You get to The stone house by following the trail about a mile in. From there you can connect with other parts of Forest Park like the Pittock Mansion. It is an easy walk most anyone can do. Most of the trail is made up of gentle slopes that are hardly noticeable with a few harder slopes that have some steepness. Dogs are welcome as long as you pick up after them. Parking is a little tricky as the park only has 6 parking spaces and 2 handicap spaces. There is street parking all around, you just have to find it. Will definitely be coming back! Spudz Classic™ The Original Microfiber Lens Cloth The most convenient microfiber cloth you’ll ever use! 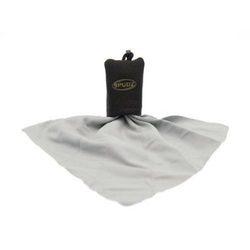 Spudz Classic combines the gentle cleaning power of microfiber with the protection of a neoprene pouch. The snap hook (or elastic cord) keeps the Spudz Classic in reach and ready to use. The sewn in microfiber cloth can’t be lost, and is ready to go with one quick grab. The high quality microfiber cloth is strong enough to use over and over, but gentle enough to thoroughly clean scratch sensitive surfaces. The Spudz Classic cleans without the need for harsh chemicals. Spudz is a reusable, environmentally friendly product. Clean your Spudz by hand-washing with a mild detergent and air drying with the cloth extended. Spudz offers fully customizable graphics using our 4 color sublimation process. Save money with the Nikon Co-Op program. This allows you to put your graphics on one side of the pouch while also promoting Nikon on the other side. You can also create your own designs for fun, or for retail. If you want to save money and time you can choose backgrounds from our featured designs. You can also try the Alpine Co-Op program which is similar to the Nikon Co-Op, but promotes Alpine Innovations instead. While out taking photographs when in was sprinkling outside I found I needed I microfiber cloth that was easy to find. I looked around the internet and found Alpine Innovations Spudz Microfiber Cloth Pouch. What is so great about this product is that the cloth is easily taken out and put back in to the pouch it is attached to. There is also a clip so that it can be attached to your camera or bag for easy use. High quality and good price. A must for all photographers! Powers Marine Park is a hidden gem here in the Portland area. From the outside it doesn't look like more than a muddy trail. The lower trail runs along the Willamette River and the upper trail runs along the train tracks. Once you get in and start walking it turns into a photographers dream. Great old trees, an old building, and tons of plant life. Great for macro photographers or if you have a telephoto lens a great place to see boats, kayaking, and avian such as cranes. Cannot wait to return in the spring to see what wonders it will behold! I love to go explore new places with my husband and my camera. It is a great joy for me to be able to show you all my work. *All photographs are protected by copyright laws by © Tanya Carriker Photography. All Photographs are property of Tanya Carriker and cannot be downloaded, used, edited, or changed in any way without the artist's permission.